Myra Garrett was a member of Bexley Borough AC and Veterans AC. In 1964 she married the 1959 Kent county 800m Champion Tony Garrett who later became the head coach at Bexley AC. Myra didn’t start running seriously until she was 42, but soon discovered she had a talent when in 1985 Myra’s sister, Karen entered her for the east London Half Marathon. Despite having no competitive running since the school sports day, Myra completed her debut race in less than two hours and thus a remarkable athletic career had started. 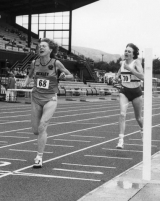 Within ten short years Myra had claimed BVAF National Veterans titles at 5000m and 10000m in both the W45 & W50 categories. On the road she was the W50 champion at 5Km in 1994 and W50 champion at 10 miles (64:03) and Half Marathon (85:22) in 1995. 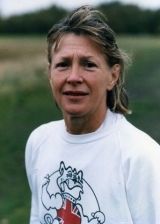 Myra was also selected to represent England in the Veterans International cross country on three occasions, finishing 2nd W50 at Sunderland (1994), 3rd W50 at Malahide , Ireland (1995) and 8th W50 at Irvine , Scotland (1996). She was also a superb Marathon runner with a relaxed, mile eating stride. She completed 13 Marathons and helped raise over £10,000 for Cancer Research in her 9 London Outings with a best of 3:11:20 to head the 1989 W45 rankings – her personal favourite performance. 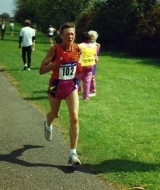 Unfortunately in 1996 Myra was diagnosed with a rare form of cancer but even whilst undergoing a course of chemotherapy she was still active throughout the summer of 1997, even competing on the track in the Veterans League for Bexley Borough AC. Sadly on Monday the 10th August 1998 Myra Garrett died peacefully. She was 55 and at the peak of her prowess as a veteran athlete. 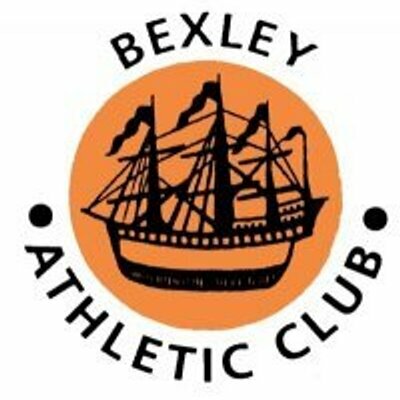 In 1999 the Borough of Bexley asked whether Bexley AC would like to take over the running of the Bexley Borough 10K and Fun Run. We were only too pleased and as a fitting tribute to Myra Garrett named the race after her in 2000.